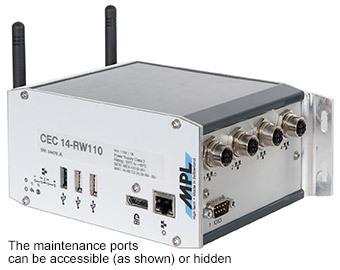 The CEC14-RW110 from MPL comes with Intel ATOM Quad-Core and is fully EN50155 certified. For shock and vibration tests (EN 61373), Category 2 Bogie mount has been chosen, the second most severe shock and vibration test in the railways standard. The EN50155 certified CEC14-RW110 is ideally suited to be used in the toughest railway applications For the environmental temperature test, the most crucial one has been selected and the unit is approved to be fully operational from -40°C up to 75/85°C. Full test records are available on request. The CEC14 is a perfect match for any demanding railways application. The technical approach of the CEC14 is unique as the standard device is very flexible and can easily be expanded to the any customer needs. Regardless if a galvanic isolation is needed (8-36VDC or up to 110VDC) or any other additional interface that is not provided in the standard configuration. The standard CEC14 already comes well equipped. However if additional interfaces are required, then all of them can be expanded to the actual need. The compact unit is equipped with an on-board soldered 32GB Flash chip. Additional Flash or a second mass storage can be added over internal mSATA or SATA ports without the need of wires. Up to 8GB ECC DDR3 memory can be installed. Within the CEC housing, there is space for up to seven mPCIe slots for expansions and therefore any function or the interface like MVB, CAN, WLAN, GPS, 4G LTE... can easily be integrated. The size of the CEC is extremely compact with 162mm x 118mm and depending on the integrated functionality and interfaces, a height of 62mm or 83 mm. The units is also available as board solution to be integrated in an existing housing or cabinet, or in a IP67 housing. The design of the CEC14 is optimized for long term availability. MPL products are typically being offered for at least 10 years after its first introduction and provides repair service for 20 years or more. MPL stocks all parts that are needed for production and/or repairs. This makes the TCO very low, next to the excellent MTBF values of the device. The BIOS source is owned by MPL and therefore can be adjusted to the customer needs. The CEC14 is designed to be used in transportation areas like trains, buses, or utility vehicles. With the available expansion capabilities and flexibility, it can interface to the vehicle communication buses or can provide various wireless functions that might be needed.